As the NFL season makes it way past the half-way mark and enter Week 9 of the regular season football games, there are a few teams that have proven themselves to be the best, and these latest power rankings show us exactly which teams are dominating, which still have a chance, and which need to drastically improve if they hope to get to the playoffs this year. With the game to determine which undefeated team would finally add a loss to their record, the Denver Broncos proved to fans and sportsbooks that they are a great team, as they beat the Green Bay Packers 29-10. They were the underdogs, but ended up beating the odds big time, which is why they are in the much deserved second spot on this week’s rankings. Only four more teams are undefeated, and that may change soon as the Packers could get their revenge this week as they play against the Panthers. The rest of the week is quite relaxed for these top tier teams, but they can’t let their guard down or they might get pummeled. Some of the worst teams in the league, Lions and Texans, will be getting their Bye week. This could be their chance to rest and regroup, and hopefully come back in on Week 10 and play better than they have been. The Steelers looked good on Sunday against the Bengals, as they got Ben Roethlisberger back, it looked like a different team, although there are still many mistakes that need to be improved upon if they want to make it to the playoffs this year. 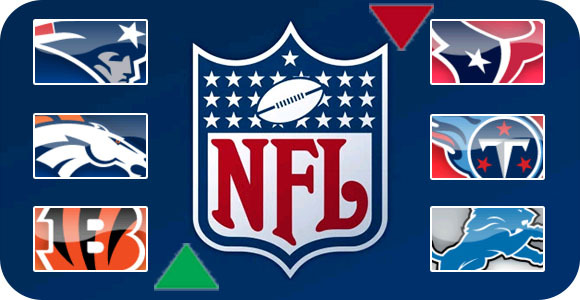 It is surprising that some NFL franchises are doing so poorly even after having better seasons in the recent past. We will have to wait and see if these upcoming football games can give us fans some hope.